HOUSTON, June 16, 2011 --This Father's Day, a recent survey conducted on behalf of Jiffy Lube International revealed that Americans agree "dad" played a vital role in shaping their perceptions of their rides and how to care for them. The vast majority of Americans (87 percent) say they've shared fond vehicle-related memories with their father or father figure -- ranging from taking a road trip (52 percent) or learning how to drive (46 percent), to learning about maintenance or car care (40 percent). In fact, more than half of Americans (54 percent) say that it was dad who taught them the most about how to take care of their vehicles. Fathers' influence on preventive maintenance is not a new trend. 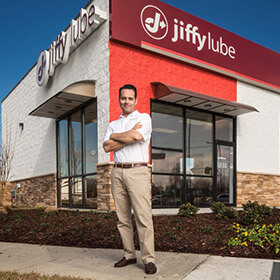 "Over the years, we've observed that a lot of drivers' maintenance knowledge and habits stem from dad," said Butch Barclay, a Jiffy Lube franchisee in Little Rock, Arkansas. "We see regular customers coming in with their sons or daughters for their first oil change or before they head to college, wanting them to become involved in the preventive maintenance process. Dads impart that basic vehicle knowledge on their children, and then look to service providers like Jiffy Lube to become the family's resource for preventive maintenance." Priority -- More than 80 percent think dad prioritizes maintaining his vehicle. Preventive maintenance -- Our fathers taught us the importance of getting regular oil changes (69 percent), using the proper grade of oil (54 percent) and checking a vehicle's tire pressure (54 percent). Practical knowledge -- 60 percent feel a dad teaching his kids about proper vehicle maintenance is one of the most important, practical lessons he can give. Butch Barclay agrees with the importance of dads passing down maintenance knowledge and tips, a sentiment echoed by his 81-year-old father, Bill -- a retired Jiffy Lube franchisee -- and his son, Austin -- 25 and store manager of one of his Jiffy Lube service centers. "Our family has interacted with drivers for three generations and while vehicles have changed a lot over the years, the importance of preventive maintenance remains the same," said Butch, 51. Agreeing with his father, Austin explained: "Regular service is crucial to maintain the life and value of a vehicle and it's key drivers learn that early on." Is dad's involvement with vehicles starting to rub off on his personality? Jiffy Lube is encouraging drivers to take a poll to describe their dad's vehicle personality on the "Keeping My Ride Alive" Facebook community. The recent survey revealed that when asked to describe their dads, 35 percent of Americans with a father or father figure in their life pegged dad as "strong and confident, like a truck or SUV," while and another 33 percent went with "reliable and practical, like a sedan or town car." In addition to participating in the poll, drivers are encouraged to share their stories in honor of Father's Day. Anyone can visit the "Keeping My Ride Alive" Facebook community to share what they learned from their father about vehicle maintenance or a memory about the first time they got behind the wheel with dad. "Keeping My Ride Alive" is a place for drivers who take pride in and who are committed to extending the life of their vehicles; to "like" the page and participate, visit www.Facebook.com/KeepingMyRideAlive. With dads across the country committed to maintaining their vehicles, Father's Day is a convenient time to help dad achieve his goal. Jiffy Lube offers the Jiffy Lube Gift Card®, which can be purchased online at JiffyLube.com or in-store at participating Jiffy Lube locations. Cards can be redeemed for services such as the Jiffy Lube Signature Service® Oil Change, which provides drivers with much more than just an oil and filter change and is a quick and convenient way for dads to maintain their vehicles.